South America is an active traveler’s playground, rewarding visitors willing to put in some physical effort with stunning vistas, unique wildlife viewing opportunities and a better understanding of the continent’s deep history. In order to grasp the importance of Peru’s iconic Machu Picchu, one must first embrace the entire journey through the Sacred Valley: countless archeological sites, rich Andean culture, remote villages and the stunning patterns of Peru’s landscapes. 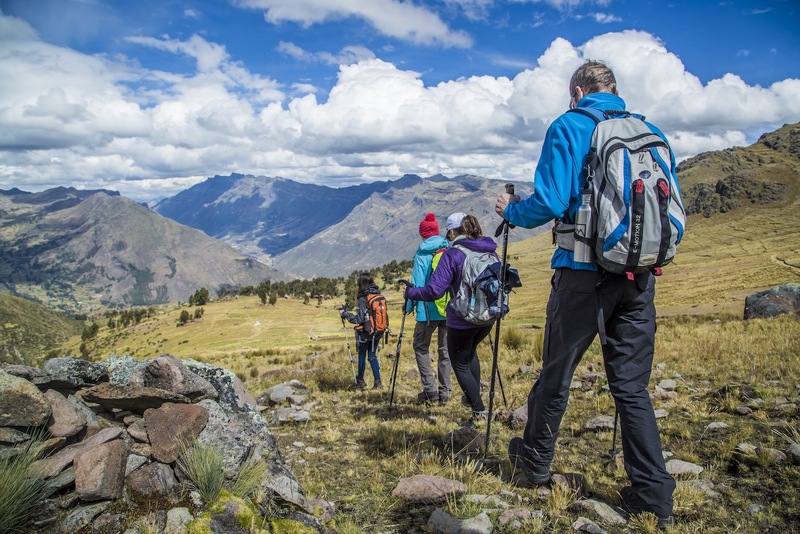 Our South America experts explain that the best way to immerse yourself in the area is to hike along the famous Inca Trail. Travelers on an itinerary like this one are fully immersed in the journey to Machu Picchu, including daily hikes to impressive archeological sites in Pisaq or Ollantaytambo, excursions to join local families for agricultural lessons and a traditional meal, watching weavers create exquisite tapestries in local markets or learning the rich history of the Sacred Valley from experienced guides. Each itinerary culminates in the grand finale: the spectacular architecture, incredible views and complicated history of the iconic Machu Picchu. Hike in Torres del Paine National Park, or mountain bike in El Calafate. Take a glacier trek on Perito Moreno Glacier. Kayak, canoe, paddle board or river raft through the waters of the Lakes District. Visit Bariloche in the Argentina’s Northern Lakes District during July through September for world-renowned skiing, snowshoeing and more in the Andes Mountains. Time in Patagonia pairs well with other regions in Chile and Argentina as well. Consider adding days in Buenos Aires to experience the “Paris of South America” or spend time in Chile’s Atacama Desert to enjoy activities like volcano trekking, hiking and mountain biking in the driest desert on earth! For firsthand accounts of activities in Patagonia, read consultant trip reports from Bob, Kayla, Ken and Jennifer! Each island in the Galapagos offers unique beauty–from lush jungles to rocky volcanic shores. Better yet, the Galapagos hosts one of the world’s best wildlife protection programs, providing visitors a one-of-a-kind experience with many unique species, such as the famed Galapagos giant tortoises, blue-footed boobies and an endless number of playful sea lions. Travelers here can best explore the scenes and inhabitants of the Galapagos through an array of exciting activities, like snorkeling, kayaking, stand up paddleboarding, hiking, biking and more. An expedition cruise is the perfect way to see the Galapagos, easily and comfortably sailing from island to island to get the full experience! At every turn, South America has an activity to offer. Snorkel on the coasts of Easter Island (Rapa Nui) or canoe in the Amazon. Kayak on Lake Titicaca, mountain bike through the Ecuadorian Andes, or hike the wide open spaces of Brazil’s Chapada Diamantina. Let us know where you want to travel, and we’ll let you know what activity options await! Outside of South America, active travel ideas can be found in all our specialty destinations: Africa, Australia, Southeast Asia and India. Discover engaging activities in Africa, like climbing Mt. Kilimanjaro, embarking on a gorilla trek or taking part in a walking safari. Explore Southeast Asia on a bike tour through Thailand’s countryside or while snorkeling in Myanmar. In Australia, fill your camera with images from guided nature walks in the Blue Mountains or try a paddle ski adventure on Lizard Island. An expedition cruise is an excellent way to experience remote places that are ripe with adventure. Read about our team members’ many adventures kayaking and cross country skiing in Antarctica, snorkeling in Papua New Guinea or kayaking among sea lions in the Galapagos. Regardless of your destination, let us know when we can design a custom trip to fit your active travel desires!